Figure 1. Peroxidase activity histostain of longitudinal sections of Lepidium sativum (cress) seeds after 16 h of imbibition. (A) longitudinal section of cress embryo and seed covering layers (endosperm, testa). 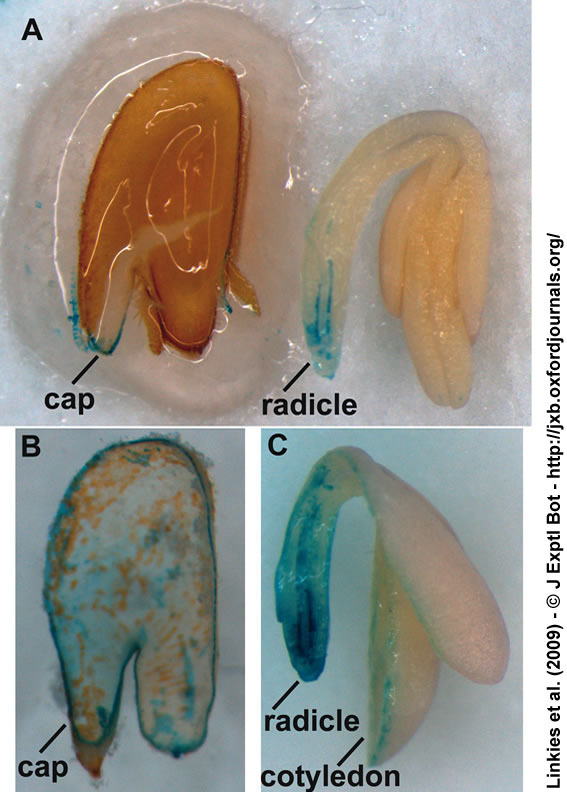 After 2 min in the staining solution, the micropylar endosperm and the radicle display staining on the cut surface. (B) Longitudinal section of a cress endosperm separated from the testa after 15 min of staining. Cell outlines can be observed over the whole endosperm surface, and the cut surface is stained completely. (C) Longitudinal section of a cress embryo. After 8 min staining, the colour spread over the whole radicle, but not the cotyledons. ‘cap’ = micropylar endosperm cap.